본 발명은 분획 및 결합형 바이오매스 당화기 및 이를 이용한 당화방법에 관한 것으로, 더욱 상세하게는 바이오매스와 효소를 혼합하여 제1관류 흐름 반응기(Plug Flow Reactor)에서 1차 당화를 수행한 다음, 상기 단관형 제1 PFR 보다 직경이 작은 PFR 2~100개로 구성된 다관형 제2 PFR에서 분획시켜 2차 당화를 수행하며, 상기 1차 당화와 2차 당화를 반복하는 분획 및 결합형 바이오매스 당화기 및 이를 이용한 당화방법에 관한 것이다. The present invention performs the fraction and coupled biomass danghwagi and relates to a glycosylation method using the same, and more particularly, primary glycosylation in the first perfusion flow reactors (Plug Flow Reactor) by mixing the biomass and the enzyme, then the is configured than short pipe-shaped claim 1 PFR is less PFR 2 ~ 100 dogs diameter performs tubular claim 2 PFR by fractionation secondary glycosylated in the primary glycosylated and second repeating the glycated fraction and coupled biomass danghwagi and this It relates to a method using glycosylation. 본 발명에 따르면, 직경이 큰 PFR에서 1차로 당화시킨 다음, 직경이 작은 PFR로 분획시켜, 2차 당화 시키므로 추가적인 혼합기 없이도 고농도의 당화합물을 수득 할 수 있다. According to the invention, to which the drive from the first glycated PFR large diameter and then, the fraction with PFR small diameter, it is possible to obtain a high concentration of the sugar compound without the need for additional secondary mixer because glycosylation. 본 발명은 분획 및 결합형 바이오매스 당화기 및 이를 이용한 바이오매스 당화방법에 관한 것으로, 더욱 상세하게는 바이오매스와 효소를 혼합하여 단관형 제1 PFR(Plug Flow Reactor)에서 1차 당화를 수행한 다음, 상기 단관형 제1 PFR 보다 직경이 작은 PFR을 2~100개 포함하는 다관형 제2 PFR에서 분획시켜 2차 당화를 수행하는 분획 및 결합 공정을 이용한 바이오매스 당화방법 및 장치에 관한 것이다. The present invention performs the fraction and coupled biomass danghwagi and relates to a biomass saccharification method using the same, and more particularly, primary glycosylation in a mixture of the biomass and the enzyme short pipe-shaped claim 1 PFR (Plug Flow Reactor), and then relates to the short pipe-shaped by the fractionation in claim 1 comprising 2 to 100 the PFR is less than the diameter of the tubular PFR dog claim 2 PFR biomass saccharification method and apparatus using the combined fractions and a step of performing a second glycosylated. 또한 바이오화학 제품은 고농도로 생산할 수 있다면 후단의 분리정제 공정 비용을 절감하여 최종 바이오화학 제품의 가격경쟁력을 확보할 수 있다. In addition, bio-chemicals can reduce the cost of the downstream purification process to produce a high concentration if you want to ensure the price competitiveness of final bio-chemical products. 이 경우에는 셀룰로스(Cellulosic), 리그노-셀룰로스(Ligno-cellulosic), 콘(Corn), 스타치(Starch)계 바이오매스(Biomass)를 높은 비율의 기질로 사용할 경우 높은 농도의 발효당을 생산할 수 있으며, 그 결과 이러한 발효당을 원료로 사용하는 경우 높은 농도의 바이오화학 제품을 생산 할 수 있다. In this case, the cellulose (Cellulosic), League no-cellulose (Ligno-cellulosic), corn (Corn), starch (Starch) system when using biomass (Biomass) with a high proportion of the substrate to produce fermentable sugars in high concentrations and, as a result, if you use these raw materials to fermentable sugars it can produce bio-chemicals of high concentration. 특히 바이오화학 제품은 발효 공정을 통해서 생산되며, 이때 많은 물을 사용하게 되는데, 이는 최종 분리 공정시 반응기의 대형화 및 에너지 소모 증가로 이어져 최종 제품 가격 경쟁력에 부정적인 영향을 준다. Especially bio-chemical products are produced through the fermentation process, wherein there is used a lot of water, which led to a large increase in energy consumption and the final separation process when the reactor gives a negative effect on the final product price competitiveness. 미국 등록특허 제 5733758호에서는 전처리된 바이오매스를 당화 및 발효시키는 수직 타워형 관류흐름 반응기에 관하여 기재하고 있다. And U.S. Patent No. 5,733,758 described the arc with respect to the pre-treated biomass to a vertical tower reactor, the perfusion flow to saccharification and fermentation. 이 발명은 다단의 관류 흐름 반응기를 이용하여 바이오매스를 발효시켜 당을 수득하고 있지만, 추가적인 믹서를 이용하여 혼합을 진행하므로 전체적인 시스템의 크기가 커지며, 점도가 높은 당을 혼합하는데 믹서를 사용하므로 에너지의 사용량이 많다는 단점을 가진다. The invention is by using a perfusion flow reactor of the multi-stage, but to obtain a sugar fermented biomass, becomes larger, the size of the overall system, so proceed to mix with an additional mixer, it uses a mixer to mix the sugar viscous energy this has the disadvantage of the amount-wise. 미국 등록특허 제 5411594호에서는 목질계 바이오매스를 연속적으로 당화시키기 위한 2단계 공정의 관류흐름 반응기에 관하여 기재하고 있다. In U.S. Patent No. 5,411,594, it discloses arc about the perfusion flow reactor of step 2, the process for the saccharification of wood-based biomass continuously. 이 발명은 두 단계의 관류흐름 반응기를 이용하여 바이오매스를 당화시키고 있어 높은 당화효율을 가지지만, 동일한 두 개의 관류 흐름 반응기를 이용하므로 시스템의 부피가 커지며, 점도가 높은 당화물을 혼합하는데 많은 에너지가 소모된다는 단점을 가진다. The invention's using a perfusion flow reactor in two steps and saccharification of biomass only have a high glycosylation efficiency, since the use of the same two perfusion flow reactor becomes large and the volume of the system, a lot of energy to mix the cargo per viscous It has the disadvantage of being consumed. 이에, 본 발명자들은 상기 문제점을 해결하기 위하여 예의 노력한 결과, 바이오매스와 효소를 혼합하여 단관형 제1 PFR(Plug Flow Reactor)에서 1차 당화를 수행한 다음, 상기 단관형 제1 PFR 보다 직경이 작은 다수개의 PFR을 포함하는 다관형 제2 PFR에서 분획시켜 2차 당화를 수행한 결과, 추가적인 혼합기의 사용이 없이도 높은 농도의 당 화합물을 수득할 수 있으며, 당화기의 투자비 및 전력 사용량을 줄일 있는 것으로 확인하고, 본 발명을 완성하게 되었다. Thus, the present inventors have made many efforts, biomass and a mixture of the enzyme by performing the primary glycosylation in short pipe-shaped claim 1 PFR (Plug Flow Reactor) Next, a diameter greater than the short pipe-shaped claim 1 PFR in order to solve the above problems by fractionation in the tubular claim 2 PFR comprising a small plurality of PFR may give the compound per of high concentration without the use of the results, an additional mixer performing the second glycosylation, that reduce the investment cost and power consumption of danghwagi OK, thereby completing the present invention. 본 발명의 목적은 분획 및 결합형 바이오매스 당화기 및 이를 이용한 바이오매스 당화방법을 제공하는데 있다. An object of the present invention to provide a fraction and coupled danghwagi biomass and biomass saccharification method using the same. 상기 목적을 달성하기 위하여, 본 발명은 (a) 단관형 제1 PFR(Plug Flow Reactor); In order to achieve the above object, the present invention is (a) short pipe-shaped claim 1 PFR (Plug Flow Reactor); (b) 단관형 제1 PFR보다 직경이 작은 PFR을 2개 내지 100개 포함하는 다관형 제2 PFR; (B) it comprises more to 100 to the small diameter PFR than the second short pipe-shaped claim 1 PFR one tubular PFR claim 2; 및 (c) 상기 다관형 제2 PFR에서 수득된 당화액의 일부 또는 전부를 단관형 제1 PFR로 재순환 시키는 수단을 포함하는 분획 및 결합형 바이오매스 당화기를 제공한다. And (c) the multi-fraction and provides a bonded biomass danghwagi including means to recycle a portion or all of the glycosylation liquid obtained in the tubular PFR claim 2 to claim 1 short pipe type PFR. 본 발명은 또한, (a) 단관형 제1 PFR(Plug Flow Reactor); The invention also, (a) the short pipe type 1 PFR (Plug Flow Reactor); 및 (b) 단관형 제1 PFR보다 직경이 작은 PFR을 2개 내지 100개 포함하는 다관형 제2 PFR을 포함하는 PFR 세트가 2~10개 직렬로 연결되어 있는 분획 및 결합형 바이오매스 당화기를 제공한다. And (b) it is a tubular claim 2 PFR PFR set the fraction and coupled biomass danghwagi connected with 2-10 series, including comprising a short pipe type small PFR diameter than the 1 PFR 2 one to 100 to provide. 본 발명은 또한, (a) 전처리된 바이오매스(Pretreated Biomass, PTB)와 당화효소를 혼합한 다음, 단관형 제1 PFR(Plug Flow Reactor)를 통과시켜 1차 당화를 수행하는 단계; The invention also, (a) a mixture of a glycosylation enzyme pre-treated biomass (Pretreated Biomass, PTB), and then was passed through a short pipe-shaped claim 1 PFR (Plug Flow Reactor) performing a primary glycosylation; (b) 상기 1차 당화액을 다관형 제2 PFR에 분획시켜, 2차 당화를 수행하는 단계; (B) the fraction to the primary Hydrolyzate is a tubular PFR claim 2, performing a second glycosylated; 및 (c) 상기 (b)단계의 2차 당화액의 일부 또는 전부를 상기 (a) 단계의 단관형 제1 PFR로 리사이클 시키는 단계를 포함하는 바이오매스의 당화방법을 제공한다. And (c) it provides a method for saccharification of biomass, comprising the step of recycling the second portion or all of the primary saccharification liquid of the step (b) to step (a) monofunctional type of claim 1 PFR. 본 발명은 또한, (a) 전처리된 바이오매스(Pretreated Biomass, PTB)와 당화효소를 혼합한 다음, 단관형 제1 PFR(Plug Flow Reactor) 및 다관형 제2 PFR을 포함하는 PFR 세트에 공급하여 당화시키되; The present invention supplies addition, (a) in a mixture of a glycosylation enzyme pre-treated biomass (Pretreated Biomass, PTB), and then, short pipe-shaped claim 1 PFR (Plug Flow Reactor) and the PFR set comprising a tubular claim 2 PFR sikidoe glycosylated; (b) 상기 단관형 제1 PFR에서 생산되는 1차 당화액을 다관형 제2 PFR에 분획시켜 2차 당화액을 생성하는 단계; (B) The primary glycosylation liquid produced in the short pipe-shaped claim 1 PFR by fractionation in the tubular PFR claim 2 wherein generating the second Hydrolyzate; 및 (c) 상기 2차 당화액을 직렬로 연결되어 있는 PFR 세트에 공급하여 당화시키는 단계를 포함하는 바이오매스의 당화방법을 제공한다. And (c) it provides a method for saccharification of biomass, comprising the step of saccharification fed to PFR set connected to said secondary Hydrolyzate in series. 본 발명에 따르면, 직경이 큰 PFR에서 1차로 당화시킨 다음, 직경이 작은 PFR로 분획시켜, 2차 당화시키므로 추가적인 혼합기 없이도 고농도의 당화합물을 수득할 수 있다. According to the invention, to which the drive from the first glycated PFR large diameter and then, the fraction with PFR small diameter, it is possible to obtain a high concentration of the sugar compound without the need for additional secondary mixer because glycosylation. 도 1은 본 발명의 바이오매스 당화 방법의 모식도이다. 1 is a schematic diagram of the biomass saccharification process of the invention. 도 2는 본 발명의 일 구현예에 따른 다관형 제2 PFR에서 단관형 제1 PFR로 일부 또는 전부를 리사이클 하는 공정과 다관형 제2 PFR의 입구 부분에 설치된 세절판을 도시한 것이다. Figure 2 illustrates the three print is installed in the entrance portion of the process and the tubular PFR claim 2 to recycling some or all of a short pipe-shaped claim 1 PFR in the tubular PFR claim 2 according to one embodiment of the present invention. 도 3은 본 발명의 일구현예에 따른 PFR이 직렬로 연결된 바이오매스 당화기를 도시한 것이다. 3 is a PFR is in accordance with one embodiment of the present invention shows a biomass danghwagi connected in series. 다른 식으로 정의되지 않는 한, 본 명세서에서 사용된 모든 기술적 및 과학적 용어들은 본 발명이 속하는 기술 분야에서 숙련된 전문가에 의해서 통상적으로 이해되는 것과 동일한 의미를 가진다. Unless defined otherwise, all technical and scientific terms used herein have the same meaning as commonly understood by one skilled in the art. 일반적으로, 본 명세서에서 사용된 명명법은 본 기술 분야에서 잘 알려져 있고 통상적으로 사용되는 것이다. In general, the nomenclature used herein is a well known and commonly used in the art. 본 발명에서는, 직경이 상이한 두 개의 PFR을 이용하여 전처리된 바이오매스의 당화실험을 수행하였다(도1). In the present invention, the saccharification experiments were carried out pre-processing of a bio the diameter of using two different mass PFR (Fig. 1). 이때 일 구현예(도2)에서는 생성되는 당화액을 재순환시켜 단관형 제1 PFR로 재공급하여 바이오매스 당화실험을 수행하였으며, 다른 구현예(도3)에서는 제1PFR 및 다관형 제2 PFR을 포함하는 PFR 세트를 여러번 반복하여 바이오매스 당화실험을 수행하였다. The work in the embodiment (FIG. 2) by recycling the Hydrolyzate is generated by re-supplied to the short pipe-shaped claim 1 PFR was performed biomass saccharification experiment, another embodiment (FIG. 3) to the 1PFR and the tubular claim 2 PFR Repeat PFR set that includes a biomass saccharification experiments were carried out several times. 그 결과 추가적인 혼합기의 사용 없이도 높은 농도를 가지는 당화합물을 수득할 수 있음을 확인하였다. As a result, it was confirmed that it is possible to obtain a compound having a high concentration of sugar without the use of additional mixers. 본 발명의 일 구현예(도2)에서는 전처리된 바이오매스와 당화효소를 단관형 제1 PFR에 공급하여 1차 당화시킨 다음, 1차 당화액을 다관형 제2 PFR로 분획하여 2차 당화시키고, 2차 당화액의 일부 또는 전부를 단관형 제1 PFR로 리사이클 시켜 당화실험을 수행하였다. To one embodiment of the present invention (Fig. 2) supplying pretreated biomass saccharification enzyme to the short pipe-shaped claim 1 PFR was fractionated on a primary glycosylation was then tubular claim 2 PFR is the primary Hydrolyzate secondary saccharification and , by recycling part or all of the secondary liquid to the short pipe type glycosylation claim 1 PFR was performed saccharification experiments. 그 결과 추가적인 혼합기의 사용 없이도 높은 농도를 가지는 당화합물을 수득할 수 있음을 확인하였다. As a result, it was confirmed that it is possible to obtain a compound having a high concentration of sugar without the use of additional mixers. 따라서, 본 발명은 일 관점에서, (a) 단관형 제1 PFR(Plug Flow Reactor); Therefore, in view the present invention is one, (a) the short pipe type 1 PFR (Plug Flow Reactor); (b) 단관형 제1 PFR보다 직경이 작은 PFR을 2개 내지 100개 포함하는 다관형 제2 PFR; (B) it comprises more to 100 to the small diameter PFR than the second short pipe-shaped claim 1 PFR one tubular PFR claim 2; 및 (c) 상기 다관형 제2 PFR에서 수득된 당화액의 일부 또는 전부를 단관형 제1 PFR로 재순환 시키는 수단을 포함하는 분획 및 결합형 바이오맥스 당화기에 관한 것이다. And (c) the fraction and coupled Bio Max danghwagi comprises means for the multi-recycling some or all of the glycosylation liquid obtained in the tubular PFR claim 2 to claim 1 short pipe type PFR. 또한 본 발명은 다른 관점에서, (a) 전처리된 바이오매스(Pretreated Biomass, PTB)와 당화효소를 혼합한 다음, 단관형 제1 PFR(Plug Flow Reactor)를 통과시켜 1차 당화를 수행하는 단계; In another aspect, the present invention is passed through from another point of view, (a) pre-treatment of biomass (Pretreated Biomass, PTB) as a mixture of glycosylation enzymes, and then short pipe-shaped claim 1 PFR (Plug Flow Reactor) performing a primary glycosylation; (b) 상기 1차 당화액을 다관형 제2 PFR에 분획시켜, 2차 당화를 수행하는 단계; (B) the fraction to the primary Hydrolyzate is a tubular PFR claim 2, performing a second glycosylated; 및 (c) 상기 (b)단계의 2차 당화액의 일부 또는 전부를 상기 (a) 단계의 단관형 제1 PFR로 리사이클 시키는 단계를 포함하는 바이오매스의 당화방법에 관한 것이다. And (c) it relates to a method for saccharification of biomass, comprising the step of recycling the second portion or all of the primary saccharification liquid of the step (b) to step (a) monofunctional type of claim 1 PFR. 바이오매스는 효소와 고르게 혼합되어 단관형 제1 PFR에 투입된다. The biomass is mixed evenly and the enzyme is injected into the short pipe-shaped claim 1 PFR. 바이오매스는 단관형 제1 PFR에서 일정시간 동안 체류하여 1차 당화 과정을 거치게 된다. Biomass to stay for some time in the short pipe type 1 PFR is subjected to the primary saccharification process. 이때 당화반응에서는 산소를 소모하게 되므로 단관형 제1 PFR에 산소를 공급하여 당화율을 향상시킬 수 있으며, 양압으로 인하여 외부의 오염물질의 유입을 차단 할 수 있다. Note that, in the glycosylation reaction, and can therefore consume oxygen improves the glycation degree by supplying oxygen to the short pipe type PFR claim 1, due to the positive pressure can block the inflow of external contaminants. 일정시간이상 체류한 바이오매스는 모노펌프에 의하여 다관형 제2 PFR로 이송되며, 이때 다관형 제2 PFR은 단관형 제1 PFR 보다 직경이 작은 PFR로 구성되어 있어 바이오매스가 다관형 제2 PFR로 분획됨에 따라 자연스럽게 혼합된다. A biomass retention over a period of time is by a mono-pump is transferred to a tubular claim 2 PFR, wherein the tubular claim 2 PFR is the biomass, it is composed of short pipe type first small PFR than the diameter PFR tubular claim 2 PFR as the fraction to be mixed naturally. 이러한 과정을 따라 많은 양의 고체가 혼합(20~30%)되어 있는 바이오매스도 혼합기의 도움이나 추가적인 점도 조절과정 없이 분획으로 인하여 혼합될 수 있다. According to this process, biomass is mixed with a large amount of solids (20-30%) may also be due to the mixed fractions without assistance or additional viscosity control process of the mixer. 2차 당화반응이 완료되면, 2차 당화액의 일부 또는 전부를 단관형 제1 PFR로 리사이클 시켜 반응을 지속하게 되며, 이때 다관형 제2 PFR에서 리사이클 되는 당화액은 단관형 제1 PFR로 이송되는 동안 관내에서 결합되어 혼합된다. When the second glycosylation reaction is completed, a secondary part or all of the glycosylation solution was recycled to the short pipe-shaped claim 1 PFR is the duration of the reaction, wherein the saccharification liquid is recycled from the tubular claim 2 PFR is transferred to the short pipe-shaped claim 1 PFR are combined in the tube are mixed while. 본 발명의 다른 구현예(도3)에서는 전처리된 바이오매스와 당화효소를 단관형 제1 PFR에 공급하여 1차 당화시킨 다음, 1차 당화액을 다관형 제2 PFR로 분획하여 2차 당화시키고, 상기 제1FPR 및 다관형 제2 PFR과 동일한 구조를 가지는 PFR 세트를 2~10번 통과시켜 당화실험을 수행하였다. Other embodiments of the present invention (FIG. 3), the pretreated biomass and to saccharification enzymes supplied to the short pipe-shaped claim 1 PFR was fractionated on a primary glycosylation was then tubular claim 2 PFR is the primary Hydrolyzate secondary saccharification and , by the first and the tubular 1FPR the PFR set having the same structure as the 2-pass PFR 2-10 times saccharification experiments were carried out. 그 결과 추가적인 혼합기의 사용 없이도 높은 농도를 가지는 당화합물을 수득할 수 있음을 확인하였다. As a result, it was confirmed that it is possible to obtain a compound having a high concentration of sugar without the use of additional mixers. 본 발명은 다른 관점에서, (a) 단관형 제1 PFR(Plug Flow Reactor); The invention in another aspect, (a) the short pipe type 1 PFR (Plug Flow Reactor); 및 (b) 단관형 제1 PFR보다 직경이 작은 PFR을 2개 내지 100개 포함하는 다관형 제2 PFR을 포함하는 PFR 세트가 2~10개 직렬로 연결되어 있는 분획 및 결합형 바이오매스 당화기에 관한 것이다. And (b) the short pipe type first fraction that is a multi-PFR set comprising a tubular claim 2 PFR to 1 than contained a small PFR 2 one to 100 diameters PFR through to 2-10 in series and coupled biomass danghwagi It relates. 또한 본 발명은 다른 관점에서, (a) 전처리된 바이오매스(Pretreated Biomass, PTB)와 당화효소를 혼합한 다음, 단관형 제1 PFR(Plug Flow Reactor) 및 다관형 제2 PFR을 포함하는 PFR 세트에 공급하여 당화시키되; In another aspect, the present invention from another point of view, (a) pre-treatment of biomass (Pretreated Biomass, PTB) as a mixture of glycosylation enzymes, and then short pipe-shaped claim 1 PFR (Plug Flow Reactor) and the PFR set comprising a tubular claim 2 PFR supplied by sikidoe glycosylation on; (b) 상기 단관형 제1 PFR에서 생산되는 1차 당화액을 다관형 제2 PFR에 분획시켜 2차 당화액을 생성하는 단계; (B) The primary glycosylation liquid produced in the short pipe-shaped claim 1 PFR by fractionation in the tubular PFR claim 2 wherein generating the second Hydrolyzate; 및 (c) 상기 2차 당화액을 직렬로 연결되어 있는 PFR 세트에 공급하여 당화시키는 단계를 포함하는 바이오매스의 당화방법에 관한 것이다. And (c) relates to a method for saccharification of biomass, comprising the step of saccharification fed to PFR set connected to said secondary Hydrolyzate in series. 효소와 혼합된 바이오매스의 투입이후 다관형 제2 PFR까지의 과정은 위에서 살펴본 바와 동일하다. Process to the enzyme and the subsequent injection of the mixed biomass is tubular claim 2 PFR is the same as shown above. 2차 당화 반응이 완료되면, 2차 당화액은 상기 PFR 세트와 동일한 구조를 가지는 다른 PFR 세트에 공급된다. When the second glycosylation reaction is completed, the second glycosylation liquid is supplied to the other PFR set having the same structure as the PFR set. 2차 당화액은 다른 PFR 세트의 단관형 제1 PFR과 동일한 구조를 가지는 PFR에 원료로 공급되며, 다른 PFR은 상기 당화액을 이용하여 당화반응을 수행한 다음, 또 다른 PFR에 공급하게 된다. Second Hydrolyzate is supplied as a raw material in PFR having the same structure as the short pipe-shaped claim 1 PFR other PFR set, other PFR is performing a glycosylation reaction using the above glycated liquid is supplied to the next, another PFR. 이러한 과정을 1~10회 반복 수행하여 최종 당화액을 생산할 수 있다. Performs this process from 1 to 10 times repeatedly can produce advanced glycation amount. 이때 상기 PFR세트를 1회만 통과시켜도 당화액의 생산이 가능하지만, 당화율을 높이기 위하여 PFR세트를 여러번 반복하여 통과시키는 것이 바람직하며, 10번을 초과하여 통과시키는 경우 당화율은 올라가지만 공장의 규모가 커지고, 사용되는 에너지의 양이 늘어나서 경제성이 없으므로 10회 이하로 통과시키는 것이 바람직하다. The plant size per rate will be traced case of the first pass only once the PFR set even possible for Hydrolyzate produced, but preferably of passing repeatedly PFR set number of times to increase the per rate, passing beyond the 10 that it is desirable to grow, the amount of energy used increases and there is no economy pass with no more than 10 times. 본 발명에 있어서, 상기 전처리된 바이오매스와 당화효소는 리파이너(Refiner)를 통과하여 혼합하는 것을 특징으로 할 수 있다. In the present invention, the pretreated biomass-saccharification enzyme and it may be characterized in that the mixture passes through the refiner (Refiner). 전처리된 바이오매스는 많은 양의 고체성분을 함유하고 있으므로, 일반적인 혼합기로는 당화효소와의 혼합이 어렵다. Pretreated biomass because it contains large amounts of solid components, a general mixer is difficult to mix with a glycosylation enzyme. 따라서 리파이너를 이용하여 많은 양의 고체를 함유하고 있는 전처리된 바이오매스와 당화효소를 혼합하는 것이 바람직하다. Therefore, it is preferable to mix the biomass pretreatment and saccharification enzymes, which contains large amounts of solids using a refiner. 이때 사용되는 리파이너는 바이오매스의 양과 점도에 따라 적절한 용량을 가지는 것을 선택하여 사용하는 것이 바람직하며, 적절한 혼합이 가능한 리파이너라면 형상 또는 재질에 제한되지 않는다. The refiner used is preferably used to select to have the appropriate capacity depending on the amount and viscosity of the biomass, and is not suitable if the mixing is possible refiner limited to the shape or material. 본 발명에 있어서, 상기 단관형 제1 PFR은 50 ~ 75℃에서 당화를 수행하는 것을 특징으로 할 수 있다. In the present invention, the short pipe type PFR claim 1 can be characterized by performing a glycosylation at 50 ~ 75 ℃. 상기 단관형 제1 PFR에서 당화는 직경이 큰 PFR를 이용하여 수행되는 것으로 바람직하게는 50 ~ 75℃에서 수행될 수 있다. In the short pipe-shaped claim 1 PFR glycosylation may be carried out preferably at 50 ~ 75 ℃ to be carried out with a diameter of greater PFR. 단관형 제1 PFR에서 당화온도가 50℃ 미만인 경우 당화반응의 효율이 떨어지게 되며, 75℃초과에서는 당화효소의 불활성화가 일어날 수 있다. In the case in short pipe-shaped claim 1 PFR is glycosylated temperature is lower than 50 ℃ and drops the efficiency of the saccharification reaction, more than 75 ℃ may occur inactivation of the glycosylated enzyme. 본 발명에 있어서, 상기 다관형 제2 PFR은 50 ~ 75℃ 및 pH 4 ~ 6에서 당화를 수행하는 것을 특징으로 할 수 있다. In the present invention, the tubular PFR claim 2 may be characterized as performing a saccharification at 50 ~ 75 ℃ and pH 4 ~ 6. 다관형 제2 PFR에서 당화는 단관형 제1 PFR보다는 직경이 작은 PFR을 이용하여 수행되는 것으로 바람직하게는 50 ~ 75℃에서 수행될 수 있다. The tubular in claim 2 PFR glycosylation may be preferably carried out at 50 ~ 75 ℃ to be performed using a PFR is less than diameter of the short pipe type 1 PFR. 다관형 제2 PFR에서 당화온도가 50℃ 미만인 경우 당화반응의 효율이 떨어지게 되며, 75℃초과에서는 당화효소의 불활성화가 일어날 수 있다. Is less than a temperature 50 ℃ glycosylated in a tubular PFR claim 2 and falls, the efficiency of the saccharification reaction, the excess 75 ℃ may occur inactivation of the glycosylated enzyme. 또한 pH 4미만 및 pH 6 초과에서는 효소의 불활성화가 일어날 수 있다. Also it may occur inactivation of the enzyme at pH less than 4 and greater than pH 6. 본 발명에 있어서, 상기 다관형 제2 PFR의 직경은 단관형 제1 PFR의 0.01 ~ 0.9배인 것을 특징으로 할 수 있다. In the present invention, the diameter of the tubular PFR claim 2 may be characterized in that 0.01 ~ 0.9 times that of the short pipe-shaped claim 1 PFR. 단관형 제1 PFR에서 1차 당화된 바이오매스는 다관형 제2 PFR을 거쳐 분획되며, 2차 당화된다. The primary glycosylation in the short pipe type first PFR biomass is fractionated and through the tubular PFR claim 2, the car 2 is glycosylated. 이때 다관형 제2 PFR은 단관형 제1 PFR의 직경보다 작은 반응기 2~100개로 구성되어 있으며. At this time, the tubular PFR claim 2 consists of 2 to 100 pieces smaller than the diameter of the short pipe-type reactor of claim 1 PFR. 다관형 제2 PFR의 직경은 단관형 제1 PFR의 0.01 ~ 0.9배인 것이 바람직하다. The diameter of the tubular PFR claim 2 is preferably 0.01 ~ 0.9 times that of the short pipe-shaped claim 1 PFR. 다관형 제2 PFR의 직경이 단관형 제1 PFR의 0.01배 미만인 경우 다관형 제2 PFR의 직경이 작아져 당화액의 흐름이 원활하지 못하게 되며, 0.9배 초과인 경우 PFR의 직경차이를 이용하여 분획이 이루어지지 못하므로 전체적인 당화효율이 감소하게 된다. The case that the diameter of the tubular claim 2 PFR is less than 0.01 times the short pipe-shaped claim 1 PFR it decreases the diameter of the tubular claim 2 PFR and prevent the flow of Hydrolyzate, using the diameter difference between the PFR case of 0.9 times excess not supported, because the fraction is made is reduced and the overall efficiency of saccharification. 본 발명에 있어서, 상기 단관형 제1 PFR 및/또는 다관형 제2 PFR은 출구 부분의 직경은 입구 부분의 직경의 0.5~1배인 것을 특징으로 할 수 있다. In the present invention, the short pipe type PFR claim 1 and / or claim 2 is tubular PFR is the diameter of the outlet portion can be characterized in that 0.5 to 1 times the diameter of the inlet portion. PFR 입구부분보다 PFR 출구 부분의 직경이 작은 경우 PFR 내부의 당화액이 PFR 출구 부분으로 이동하면서 자연스럽게 혼합될 수 있다. If the diameter of the PFR outlet portion than the PFR inlet portion of smaller internal PFR Hydrolyzate can be mixed naturally while moving in the PFR outlet section. 하지만 직경의 비가 1:0.5 미만인 경우 출구 부분의 직경이 너무 좁아져서 당화액의 흐름에 방해가 될 수 있으며, 1:1초과가 되어 출구 부분의 직경이 더 넓은 경우 혼합효과를 기대하기 어렵다. However, the diameter ratio of 1: 0.5 is less than the diameter of the outlet section so too narrow, and could interfere with the flow of Hydrolyzate 1: 1 is greater than it is difficult to expect the case where the diameter of the outlet part broader mixing effect. 또한 상기 직경이 작아지는 PFR을 사용하는 경우 출구 부분의 압력이 높아져 당화를 촉진시키는 효과를 기대할 수 있다. Also, if you are using a PFR which is the smaller diameter can be higher the partial pressure of the outlet expect the effect to promote saccharification. 본 발명에 있어서, 상기 단관형 제1 PFR은 산소를 공급하여 당화반응을 수행하며, 상기 산소를 공급하는 수단을 추가로 포함하는 것을 특징으로 할 수 있다. In the present invention, the short pipe-shaped claim 1 PFR may be characterized in that it comprises performing a glycosylation reaction with oxygen, and further means for supplying the oxygen. 당화반응은 일반적으로 당화효소가 산소를 소모하여 바이오매스를 당화시키는 반응이다. Glycosylation reaction is generally glycosylated enzyme reaction which consumes oxygen saccharification of biomass. 특히 셀룰로스 당화에 작용하는 효소 LPMO (lytic polysaccharide mono-oxygenases)의 최대 활성을 위해서는 산소 공급이 최적화 되어야한다. In particular, oxygen must be supplied in order to optimize the maximum activity of the enzyme LPMO (lytic polysaccharide mono-oxygenases) that acts on the cellulose glycosylation. 따라서 반응기에 산소를 공급하는 경우 전체적인 당화효율을 올릴 수 있게 된다. Therefore, if the supply of oxygen to the reactor it is possible to raise the overall efficiency of saccharification. 또한 공급되는 산소로 인하여 반응기 내부는 외부보다 높은 압력을 유지하게 되므로 외부 미생물에 의한 이상반응을 최소화 할 수 있다. In addition, due to oxygen supplied to the reactor it is therefore to maintain a higher pressure than the outside it is possible to minimize the adverse effects caused by outside microorganisms. 아울러 단관형 제1 PFR의 상부로 바이오매스 또는 당화액이 공급되므로 상부에 산소를 공급하는 경우, 혼합에 의하여 반응기 전체에 산소가 공급되므로 단관형 제1 PFR의 상부로 산소를 공급하는 것이 바람직하지만, 이에 제한되는 것은 아니다. In addition, since the biomass or saccharification liquid is supplied to the upper portion of the short pipe-shaped claim 1 PFR case of supplying oxygen to the upper portion, by mixing, because oxygen is supplied to the whole reactor is preferable to supply oxygen to the upper portion of the short pipe-shaped claim 1 PFR but , without being limited thereto. 본 발명에 있어서, 상기 단관형 제1 PFR 및/또는 다관형 제2 PFR에는 당화액을 이송함과 동시에 당화액의 혼합효율을 증가시키기 위한 모노펌프를 추가로 포함할 수 있다. In the present invention, the short pipe type PFR claim 1 and / or claim 2 is tubular PFR may be included at the same time as transferring the Hydrolyzate additional mono pump for increasing the mixing efficiency of the saccharification mixture. 당화액은 중력과 압력에 의하여 이송이 가능하지만, 단관형 제1 PFR 및/또는 다관형 제2 PFR에는 모노펌프를 설치하여 이송하는 것이 바람직하다. Hydrolyzate is is preferred to feed to the Mono pump installation can be transported by gravity and pressure, but the short pipe type PFR claim 1 and / or claim 2 is tubular PFR. 이때 반응기내의 압력과 중력의 영향을 고려하여 펌프의 용량을 선택하는 것이 바람직하며, 펌프의 전단부에서는 첨가제를 공급하는 수단을 설치하여 당화액과 첨가제가 이송 중에 자연스럽게 혼합되도록 하는 것이 바람직하다. The preferable to select the capacity of the pumps, taking into account the effect of pressure and gravity in a reactor, and it is preferable that the front end of the pump and a means for supplying an additive to be mixed in the natural Hydrolyzate and feed additives. 이때 사용되는 첨가제는 수산화나트륨(NaOH) 및/또는 계면활성제를 사용할 수 있다. The additives used may be sodium hydroxide (NaOH) and / or a surfactant. 본 발명에 있어서, 상기 다관형 제2 PFR입구에는 분획을 위한 세절판이 설치된 것을 특징으로 할 수 있다. In the present invention, the multi-tubular claim 2 PFR inlet may be characterized in that the three print for a fraction provided. 세절판은 원형의 판에 다수개의 구멍이 형성된 판으로 일측면에는 단일 PFR인 단관형 제1 PFR이나 이송관이 결합되고 타측에는 다수개의 구멍에 다수개로 구성되는 다관형 제2 PFR이 결합된다. Three Out is coupled to a multi-tubular claim 2 PFR coupled to a plurality of two days PFR of short pipe-shaped claim 1 PFR or air line, the one side of a plate formed of a hole in the circular plate and configured multiple pieces in a plurality of holes other side. 이 세절판은 당화액이 여러개의 관으로 구성된 다관형 제2 PFR에 고르게 분배되도록 하는 역할을 하며, 다관형 제2 PFR에 고르게 분배될 수 있는 형상이라면 제한없이 사용가능하다. Out of these three can be used if no geometry that can be glycosylated liquid serves to ensure even distribution of the multi-tubular PFR claim 2 consisting of a number of tubes, and the even distribution of the tubular PFR claim 2 limits. 이하, 실시예를 통하여 본 발명을 더욱 상세히 설명하고자 한다. The present invention will be described in further detail with reference to the following examples. 이들 실시예는 오로지 본 발명을 예시하기 위한 것으로, 본 발명의 범위가 이들 실시예에 의해 제한되는 것으로 해석되지 않는 것은 당업계에서 통상의 지식을 가진 자에게 있어서 자명할 것이다. These embodiments will be apparent to a person skilled in the art that for the purpose of illustrating the present invention only, the scope of the present invention is not construed as being limited by these Examples in the art. 상기 바이오매스 당화기의 경제성을 분석하기 위하여 연간 22만톤의 Cellulosic Sugar를 생산할 수 있는 공정을 구성해 보았다. I saw configuring a process which can produce 220,000 tons per year of Cellulosic Sugar to analyze the economic feasibility of the biomass danghwagi. 25% 고체함량을 가지는 전처리 바이오매스는 시간당 216 wet Ton/hr이 투입되며, 8시간 이후에 충분히 액화될 것으로 예상된다. 25% of pre-treatment of biomass has a solids content were added per hour 216 wet Ton / hr, is expected to become sufficiently liquefied after 8 hours. 또한 이때까지의 반응 시간을 고려한 반응기 전체 부피는 1729 Ton규모로 설정하였다. In addition, the total volume of the reactor considering the response time to the case was set to 1729 Ton scale. 이를 반영한 공정 구성을 아래와 같이 설계해 볼 수 있다. This can be seen as a process designed to reflect the following configuration. 반응기 높이는 단관형 PFR의 경우 16m, 다관형 PFR의 경우 10m로 가정하고, 단관형 PFR은 지름 6.5m로 구성하였으며, 다관형 PFR은 지름 0.64m인 6개의 PFR로 구성하였다. 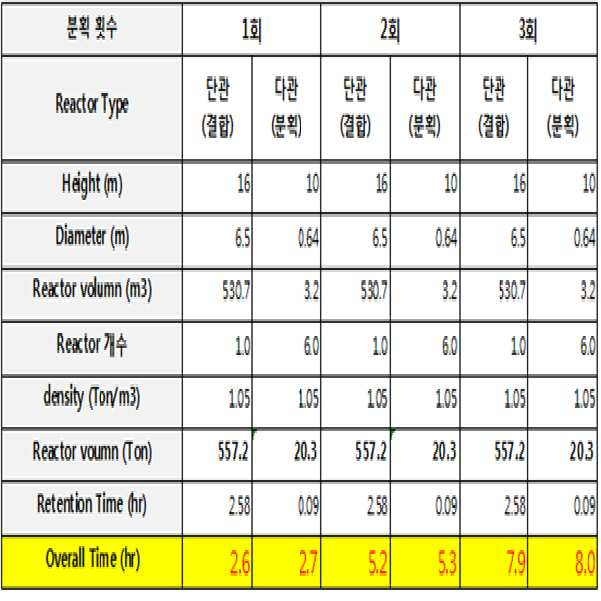 If the short pipe type PFR reactor height was composed of 16m, the case of the tubular PFR assumed to be 10m, and the short pipe type PFR is 6.5m in diameter, the tubular PFR was configured with a diameter of 0.64m six PFR. 총 3번의 분획/결합 반응을 통하여 전처리 바이오매스의 액상화 및 당화가 가능한 것으로 나타났다. Showed that the liquefaction and saccharification of pretreated biomass available through a total of three fractions / coupling reactions. 따라서 단관형 반응기와 다관형 반응기를 3회 연속 사용하는 것으로 기존의 바이오매스 당화기와 유사하거나 더욱 뛰어난 효율을 나타낼 수 있으며, 이때 사용되는 시스템의 전체 크기도 기존의 반응기에 비하여 상당부분 줄어드는 것으로 나타났다. 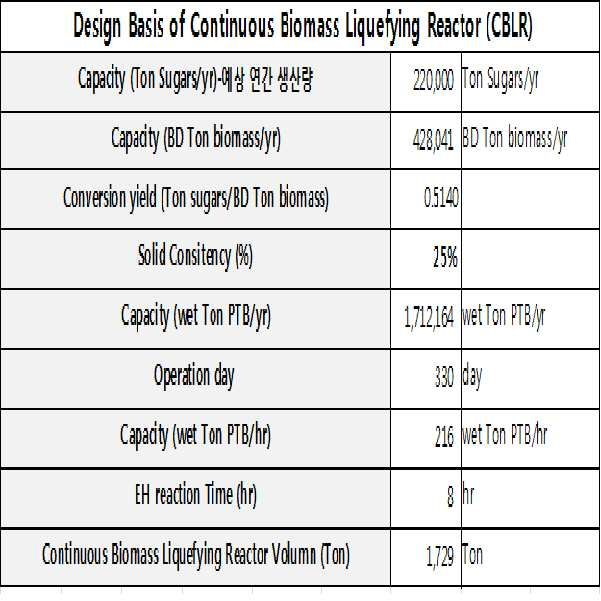 Thus, and by using short pipe reactor and the tubular reactor three times in a row it can represent the existing biomass danghwagi with similar or even better efficiency, wherein the total size of the system used also showed decreased significantly compared to the conventional reactor. 또한 본원 발명의 당화기는 교반기를 사용하는 기존의 바이오매스 당화기 보다 투자비 및 전력소모량이 감소하는 것으로 나타났다. Also danghwagi of the present invention have been shown to reduce the investment cost and power consumption than conventional biomass danghwagi using a stirrer. 비교적 저비용의 펌프(수천만원)만으로 교반이 이루어지는 본원 발명의 경우에는 고비용의 교반기(수억~수십억원)를 사용하는 기존 바이오매스 당화기들에 비하여 투자비를 최대 97%까지 절감할 수 있는 것으로 나타났으며, 또한 전력소모량에 있어서도 본원 발명의 당화기는 펌프만을 사용하여 약 40KW의 전력 (10KW, 4기)이 필요하지만, 교반기를 사용하는 기존 당화기들은 이에 비하여 많은 전력을 필요로 하는 것으로 나타났다(226~354KW). For relatively invention agitation takes place with only low cost of the pump (can be won) there was found to be capable of reducing the investment cost of up to 97% than that of the current biomass danghwagi to use the high cost of the agitator (hundreds to several tens million) , and shown to require existing danghwagi are much power as compared thereto, which also danghwagi of the present invention using only pump required power (10KW, 4 groups) of about 40KW, but the use of a stirrer in power consumption (226 ~ 354KW ). 따라서 본원 발명의 당화기를 사용하는 경우, 기존의 당화기에 비하여 적은 투자비와 운영비로 동일한 성능을 보일 수 있는 것으로 나타났다. Therefore, when using the danghwagi of the present invention, it showed the same performance that can be seen with less capital and operating costs than the conventional danghwagi. 이상으로 본 발명 내용의 특정한 부분을 상세히 기술하였는 바, 당업계의 통상의 지식을 가진 자에게 있어서 이러한 구체적 기술은 단지 바람직한 실시 양태일 뿐이며, 이에 의해 본 발명의 범위가 제한되는 것이 아닌 점은 명백할 것이다. Or more by this description chair according to with a particular ordinary skill in the section bar, the art hayeotneun detail of the present invention information is just only yangtaeil a preferred embodiment and does not to be limit the scope of the present invention thereof will be apparent will be. 따라서, 본 발명의 실질적인 범위는 첨부된 청구항들과 그것들의 등가물에 의하여 정의된다고 할 것이다. Thus, the substantial scope of the present invention will be defined by the appended claims and equivalents thereof. (c) 상기 다관형 제2 PFR에서 수득된 당화액의 일부 또는 전부를 단관형 제1 PFR로 재순환 시키는 수단. (C) means for the multi-recycling some or all of the glycosylation liquid obtained in the tubular PFR claim 2 to claim 1 short pipe type PFR. 을 포함하는 PFR 세트가 2~10개 직렬로 연결되어 있는 분획 및 결합형 바이오매스 당화기. PFR sets 2-10 are series-connected to the fraction, and coupled biomass danghwagi which comprises a. 제1항 또는 제2항에 있어서, 바이오매스와 당화효소를 혼합한 바이오매스 원료를 단관형 제1 PFR로 공급하는 리파이너를 추가로 포함하는 하는 바이오매스 당화기. According to claim 1 or 2, wherein the biomass danghwagi for containing biomass and biomass raw material a mixture of glycosylation enzymes to add a refiner supplying a short pipe type first PFR. 제1항 또는 제2항에 있어서, 상기 단관형 제1 PFR 및/또는 다관형 제2 PFR 출구의 직경은 입구 직경의 0.5~1배인 것을 특징으로 하는 바이오매스 당화기. 3. A method according to claim 1 or 2, wherein the short pipe type first PFR and / or the second tubular PFR outlet diameter biomass danghwagi, characterized in that 0.5 to 1 times the diameter of the inlet. 제1항 또는 제2항에 있어서, 상기 단관형 제1 PFR의 상부에는 산소를 공급하는 수단을 추가로 포함하는 바이오매스 당화기. 3. A method according to claim 1 or 2, wherein the biomass danghwagi further comprising a means for supplying an oxygen upper portion of the short pipe type first PFR there. 제1항 또는 제2항에 있어서, 상기 단관형 제1 PFR 및/또는 다관형 제2 PFR에는 당화액을 이송함과 동시에 당화액의 혼합효율을 증가시키기 위한 모노펌프를 추가로 포함하는 바이오매스 당화기. According to claim 1 or 2, wherein the short pipe type first PFR and / or multi-tubular second PFR, the biomass further comprises a mono-pump for increasing the mixing efficiency and at the same time transferring the Hydrolyzate Hydrolyzate danghwagi. 제7항에 있어서, 상기 모노펌프의 전단에는 첨가제를 공급하는 수단을 추가로 포함하는 바이오매스 당화기. The method of claim 7, wherein the front end of biomass danghwagi further comprising a means for supplying an additive of the mono pump. (c) 상기 (b)단계의 2차 당화액의 일부 또는 전부를 상기 (a) 단계의 단관형 제1 PFR로 리사이클 시키는 단계. (C) the step of recycling a part or all of the secondary liquid in the saccharification step (b) to step (a) monofunctional type of claim 1 PFR. (c) 상기 2차 당화액을 직렬로 연결되어 있는 PFR 세트에 공급하여 당화시키는 단계. (C) the step of saccharification fed to PFR set connected to said secondary Hydrolyzate in series. 제10항 또는 제11항에 있어서, 상기 전처리된 바이오매스와 당화효소는 리파이너(Refiner)를 통과하여 혼합하는 것을 특징으로 하는 바이오매스의 당화방법. Claim 10 or claim 11, wherein the pretreated biomass-saccharification and enzyme saccharification method of biomass characterized in that the mixture passes through the refiner (Refiner). 제10항 또는 제11항에 있어서, 상기 단관형 제1 PFR은 50 ~ 75℃에서 당화를 수행하는 것을 특징으로 하는 바이오매스의 당화방법. Claim 10 or claim 11, wherein the short pipe-shaped claim 1 PFR is glycosylated method of biomass, characterized in that to perform the saccharification at 50 ~ 75 ℃. 제10항 또는 제11항에 있어서, 상기 다관형 제2 PFR은 50 ~ 75℃ 및 pH 4 ~ 6 에서 당화를 수행하는 것을 특징으로 하는 바이오매스의 당화방법. Claim 10 or claim 11, wherein the tubular claim 2 PFR is 50 ~ 75 ℃ and saccharification process of biomass, characterized in that pH to perform a saccharification at 4-6. 제10항 또는 제11항에 있어서, 상기 단관형 제1 PFR 및/또는 다관형 제2 PFR은 출구 직경은 입구 직경의 0.5~1배인 것을 특징으로 하는 바이오매스의 당화방법. Claim 10 or claim 11, wherein the short pipe type PFR claim 1 and / or the tubular PFR claim 2 is the exit diameter of the glycosylation process of biomass, characterized in that 0.5 to 1 times the diameter of the inlet. 제10항 또는 제11항에 있어서, 상기 단관형 제1 PFR의 상부로 산소를 공급하면서 당화반응을 수행하는 것을 특징으로 하는 바이오매스의 당화방법. Claim 10 according to any of the short pipe type glycosylation method of the first biomass while supplying oxygen to the upper portion of the PFR is characterized in that performing a glycosylation reaction according to claim 11. 제10항 또는 제11항에 있어서, 상기 단관형 제1 PFR 및/또는 다관형 제2 PFR에는 당화액을 이송함과 동시에 당화액의 혼합효율을 증가시키기 위한 모노펌프를 설치하고, 상기 모노펌프를 통하여 당화액을 이송하는 것을 특징으로 하는 바이오매스의 당화방법. Claim 10 or claim 11, wherein the short pipe-shaped claim 1 PFR and / or the tubular claim 2 PFR has at the same time as transferring the Hydrolyzate install the Mono pump for increasing the mixing efficiency of the Hydrolyzate and the mono pump the glycosylation method of the biomass, characterized in that for transporting the liquid through glycosylation. 제18항에 있어서, 상기 모노펌프의 전단에 첨가제를 공급하는 것을 특징으로 하는 바이오매스의 당화방법. 19. The method of claim 18, the method of saccharification of biomass, characterized in that for supplying the additive to the front end of the mono pump. 제19항에 있어서, 상기 첨가제는 계면활성제 및/또는 수산화나트륨(NaOH)인 것을 특징으로 하는 바이오매스의 당화방법. 20. The method of claim 19 wherein the additive is glycosylated method of biomass, characterized in that surfactants and / or sodium hydroxide (NaOH).